Nothing makes a new parent swoon like when babies smile their first toothless smile! There is the involuntary smile, which is awfully cute, but not exactly sincere, as it is not on purpose. Even premature one-day-old babies in the neonatal intensive care unit (NICU) will smile in response to reflexes kicking in or twitches in the facial muscles. 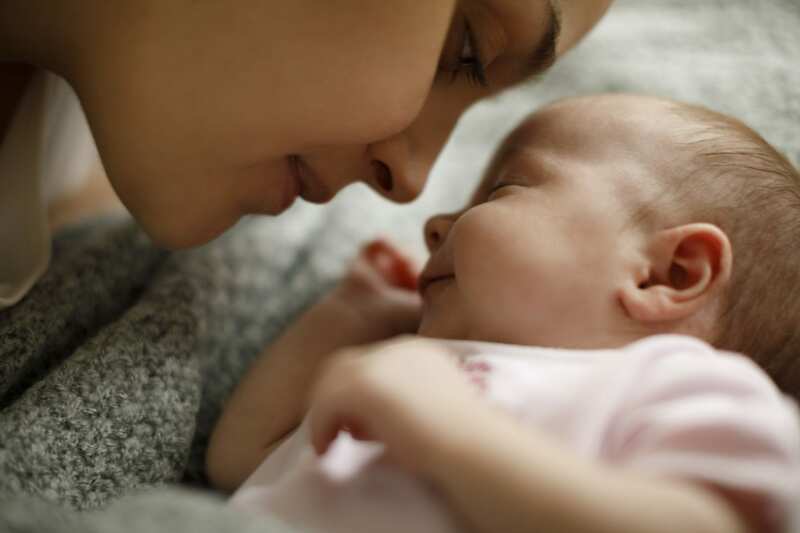 As other newborn reflexes are designed to help your baby eat (such as the rooting reflex) or protect them from harm (palmar reflex), I like to believe the involuntary smile is designed to help with bonding between the baby and the parent. Over and over again I get to watch new parents fall a little more in love every time their baby breaks out that little grin. They yell out, “oh, look . . . she’s smiling!” Whereas some healthcare professionals might say, “well actually, she’s just grimacing. She can’t actually smile on purpose yet.” I just say “Yes, she is! She loves you! Smile back at her.” Whether it is purposeful or not, it is stinkin’ adorable! Babies typically are able to smile voluntarily in response to something that actually makes them happy around six to ten weeks of age. You can help encourage the first smile! Because new babies can best see approximately ten to twelve inches from their face, hold your baby face to face in your lap. The adorable little giggle comes shortly after that. It is so important to make it a point to make your baby belly laugh at least five times per day. Just like in adults, laughing releases endorphins that boost their mood and help to form a bond with who they are laughing with. This all relates back to the importance of that early bonding and attachment between baby and care-giver. The early attachment sets the foundation for the child’s sense of security and self-confidence later on. Recent studies are finding that the early attachment is even more important than we originally thought! Early bonding and attachment to a parent or care-giver is also a predictor of future academic skills in addition to mental health, self-esteem and self-confidence. Give your baby a baby massage. This skin-on-skin contact is so important for bonding and development. Look into your baby’s eyes and talk to your baby. Tell her stories and talk about your day. Blow raspberries on your baby’s belly. Count her toes and tickle her tiny feet. Use puppets and stuffed animals to make voices and make her laugh. Be silly. Put her shoes on her hands and put her socks on her head to make her giggle. During bath-time drizzle water on her belly. Pretend to lose her. Call her name and when she says “here I am” act surprised and hug her. Play peek-a-boo (this also helps teach object permanence). Hide stuffed animals under blankets and find them together. Pretend she is an airplane and make her fly around the room. Clap her hands together to music. Clap her opposite hands and feet together (this also helps with brain development). Make funny faces at her and see if she replicates the face. Allow her to look in a mirror with you and make funny faces together. There are so many milestones throughout the first few years, but don’t underestimate the importance of smiling and laughing every day. It can be easy to get caught up in child care and work and everything else we need to do every day, but try to make time for giggles!